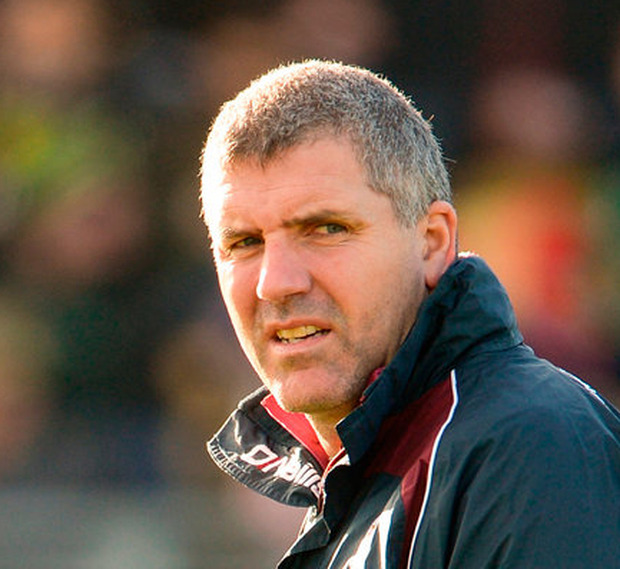 At some point the penny dropped for Galway manager Kevin Walsh. Where the ­accumulation of evidence became so overwhelming that it could no longer be ignored. The Connacht final last summer might have been one of the pivotal moments. Roscommon ran them dizzy from the throw-in, racing into a five-point lead, and in the 14th minute came the first goal. A diagonal ball set up Cian Connolly, who danced around his man, left totally isolated and exposed. The second goal in the 40th minute further showcased their frailties. A 20-year-old Brian Stack was allowed cruise through the centre of the Galway defence without a hand placed on him. If that didn't convince Walsh, then maybe the game against Kerry did. In the All-Ireland quarter-finals Kieran Donaghy terrorised Galway in the air and scored the game's only goal in the first half when catching a high ball and breaking through two defenders. Galway created numerous goal chances the same day, but their defence looked unfit for purpose. The team looked half-baked. The year before Tipperary had opened them up in Croke Park and with a season in Division 1 lurking it was time to take decisive action. Out of that came the call that brought Paddy Tally, who has been travelling down to Galway on average once a week since arriving before Christmas. Attributing all of Galway's defensive success to Tally in such a relatively short space of time might be as naive as the defending which brought him there in the first place. But he has had clear influence and added a new dimension. Last year he bolstered his reputation by leading outsiders St Mary's to a Sigerson Cup, having first shot to prominence when coaching Tyrone to their maiden All-Ireland senior title in 2003, at 29. Galway have come in for criticism for being too defensive. But results tend to soothe those aches. A favourite for relegation in their first season back in Division 1, they've reached the final unbeaten, a stand-out achievement. Three years ago they conceded eight goals in Division 2, only one fewer the year after and one fewer again when they won promotion in 2017. Despite the step up this year, they have conceded just one goal across their seven league games. The team that handed out goals on a plate has been transformed, at least for now. "I would say it was a big positive Kevin Walsh was prepared to go outside the county to get extra support," says Ray Silke, the former Galway captain. "That's a good credit to him. Tally has added value everywhere he has been. I think it is a fair point to say he has added something to the mix." Galway's first opponents after Tally's arrival were his native Tyrone in Salthill. Tally is Tyrone to the core, from Galbally, and he still lives in the county despite working as a PE lecturer in St Mary's in Belfast. It was in Tyrone he made his name as a coach alongside Mickey Harte, in 2003 and '04, before the relationship cooled and they parted ways. Harte deals with this separation in his second book, accusing Tally of overstepping the mark by seeking to influence selection and tactical issues, which was not his domain. Even if that were a bone of contention, many felt the decision to let him go was unduly harsh. He was extremely popular with the Tyrone players. The mood change in the relationship is evident in Harte's contrasting references to Tally in each of his two books. In Knocking Down Heaven's Door, released after their win in 2003, Harte is unequivocal in his praise of Tally. "Paddy Tally has been a tremendous boost to the scene," he stated. "Myself and Fr Gerard (McAleer, team selector) wouldn't be close to having the expertise he has when it comes to fitness, diet and nutrition. Paddy brings much more than expertise too; he brings what I call effervescence. There's just an incredible enthusiasm about him. He's always thinking, always planning, always reading up, always writing stuff down, always throwing ideas at you." But in his later book, Harte, published in 2009, he addressed the fall-out. Having acknowledged the "terrific influence" of Tally as team trainer in 2003 and his "cutting-edge" drills, Harte cut to the chase. "The trainer trains the team. I pick it. Paddy seemed happy in that framework, but during the championship I discovered he was talking to influential players outside of training sessions about certain team selections. The team selection falls to me. No one else." Tally has never spoken about this episode but it meant his time with Tyrone, at least while Harte remained in charge, was done. He fell back into St Mary's and having brought in Ballinderry's Brian McIver towards the end of the last decade to help manage their teams, he later joined McIver as part of Ross Carr's management team in Down in 2009. When James McCartan took over from Carr he retained the pair for two years, with Down reaching the All-Ireland final in 2010. McIver brought Tally with him when he became Derry manager for three years in 2012. They led Derry out of Division 2 and, like Galway, went to a Division 1 league final against Dublin in their first year back up. But having played well against Dublin in Celtic Park, winning by six points six weeks earlier, they were destroyed in the final. The lesson will be useful heading into a similar challenge this afternoon. "He is a top-class coach," says McIver. "Very, very organised. Reads the games very well. Very good in terms of identifying areas you need to work on. We might have met up on Monday evening and went through the game and looked at wee areas we needed brushing up on, and he was very methodical. Very good with players, very good rapport. In my time he certainly knew how to get the best out of players." Unlike the situation in Tyrone, in Derry McIver was only too happy to lean on Tally's observations about the team's form and various strengths and weaknesses. McIver has seen "glimpses" of Galway this year. "I think you can see Paddy's influence coming through in terms of how well organised they are. How disciplined they are in terms of the defensive side and in breaking at pace. I have great respect for Kevin Walsh. I have followed their progress to a certain extent and I always felt they were a side that were more than capable of stepping up to be one of the top sides in the country if they got things right. It is very early days. I know they will feel they will learn a lot about themselves when they go to Croke Park on Sunday. And in the championship against Mayo in May." Twenty-one years ago Tally, the team's free-taker, played a large part in Galbally reaching the Tyrone senior football final. But he has earned far greater notice as a coach. "Paddy is a very earnest, enthusiastic, friendly, open, positive, driven, inspiring man," says one source. "He has great attention to detail, and has no airs or graces." His work in maintaining a competitive St Mary's in the Sigerson is widely admired. He relies greatly on persuasion when recruiting players, many of them from Tyrone, to the college, not enjoying the scholarship might and magnetism of the big universities. Last year's win in the competition, given their limited resources, was seen as almost miraculous. If there are misgivings in Galway about the county's altered style, they are in the minority. Down have traditionally been viewed in a similar light to Galway with a reputation for playing football that's easy on the eye. But Tally had a role there too, receiving strong backing from one of their most talented footballers, Danny Hughes. "He was super. I can't speak highly enough of him," says Hughes. "He was a breath of fresh air. When Ross Carr left there was rumour that Paddy was going to go for the job and the players would have been happy with that move. But then I suppose Down did not really appoint outside managers and had no history of it." Hughes sees a Galway team that is defensively sounder. "I don't think that is a crime. I think the criticism has been overblown. I think Sunday is all about building confidence for the players. They haven't performed that well in Croke Park to date and if they concentrate on a really good performance and are close then I think that is a real positive thing going forward."